Ross is having an incredibly rough day in the market today, and for good reason. The company reported its earnings for the first quarter of 2016 yesterday after the closing bell. Unfortunately, the company missed expectations with regard to revenue and set expectations for a relatively weak second quarter. Today, we’ll talk about what we saw from the earnings report, how investors are reacting to the news, and what we can expect to see from ROST moving forward. Top Line Revenue – In terms of revenue, ROST unfortunately missed the mark. During the first quarter, analysts were expecting that the company would generate revenue in the amount of $3.12 billion. However, this figure was missed. During the quarter, Ross only generated revenue in the amount of $3.09 billion. The reason revenue came in a bit low was the fact that same store sales missed the mark. While analysts expected 2.5% in same store sales growth, the company announced that during the quarter, the growth came in at only 2%. Earnings Per Share – Earnings per share was the only area of positive news from the company’s earnings report. During the first quarter, analysts expected that the company would produce earnings in the amount of $0.73 per share. During the quarter, ROST generated earnings directly in line with expectations. Guidance – At this point, between positive earnings and negative revenue, the report is a wash. However, guidance breaks the tie. Unfortunately ROST released relatively weak guidance for the second quarter. During the quarter, analysts are expecting that the company will generate earnings in the amount of $0.70 per share. However, the company reported that it is expecting earnings for the second quarter to come in between $0.64 per share and $0.67 per share. Unfortunately, the company is also expecting to see a decline in same store sales growth. During the second quarter, it is expecting for same store sales to grow by between 1% and 2%. As investors, we know that the news moves the market. Any time there is positive news released with regard to a publicly traded company, we can expect to see gains in the value of the stock associated with the company as a result. Adversely, when negative news is released with regard to a publicly traded company, we can expect to see declines in the value of the stock. In this particular case, ROST not only missed the mark with regard to revenue, the company missed the mark with regard to guidance for the second quarter. As a result, we’re seeing declines in the value of the stock today. Currently (11:18), Ross Stores stock is trading at $53.45 per share after a loss of $2.07 per share or 3.73% thus far today. Moving forward, I have a relatively mixed expectation of what we can expect to see from ROST. In the short term, things aren’t looking great for the stock. After all, after reporting negative results for the first quarter, the company is likely to see more declines as investor fear takes hold. However, in the long run, I see Ross Stores as a relatively safe play. The reality is that the company has become a household name in the United States, and has worked very hard to get there. When it comes to ROST, I see this as a company that has the ability to get over hurdles and grow. So, I’m still expecting to see growth in the long run. Where do you think ROST is headed moving forward and why? Let us know your opinion in the comments below! It is amazing to see this happen right after TJX reported a great quarter. Here in North Carolina, Ross and TJ Maxx are basically the only competitors in the low end retail market. 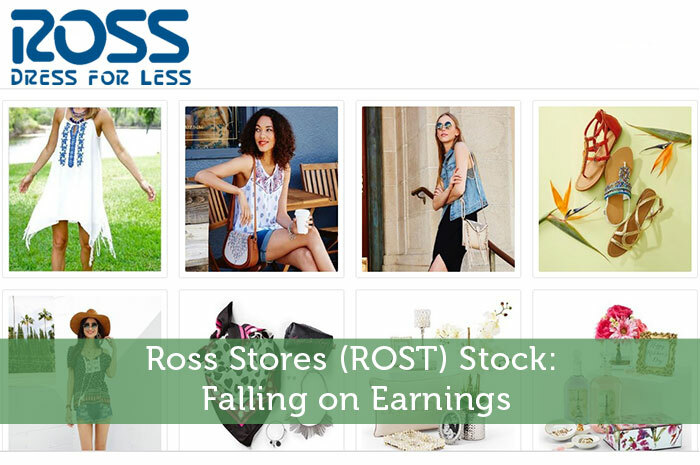 I was shocked to see Ross drop so much shortly after TJX blew out the quarter. Do you think Ross will recover and move higher?